"Most pilots wouldn't attempt this… It takes a lot of skill and a lot of practice." Paramount has revealed a new behind-the-scenes featurette for Mission: Impossible - Fallout, once again directed by Christopher McQuarrie. 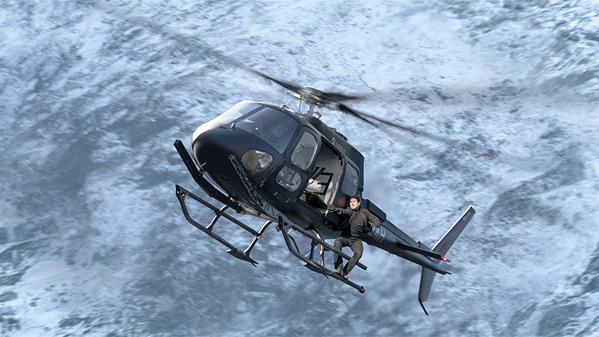 This video dives into the real stunts in the movie, focusing specifically on the helicopter stunt filmed in Norway. This is the same big action scene teased in the first photo from the film, though now that we have a full trailer there's obviously a whole bunch of thrilling action to see. As usual, Tom Cruise did all of his own stunts for this new Mission: Impossible. And it seems that he had to quickly learn how to fly a helicopter solo, which was rigged with cameras for this sequence. It's crazy. And awesome. All the internal camera shots are incredible, it's going to be amazing to see on the big screen. I'm even more hyped for this. You can also watch the first official trailer for Mission: Impossible - Fallout here, to see more footage. Here's the vague synopsis: The best intentions often come back to haunt you. Mission: Impossible - Fallout finds Ethan Hunt (Tom Cruise) and his IMF team (Alec Baldwin, Simon Pegg, Ving Rhames) along with some familiar allies (Rebecca Ferguson, Michelle Monaghan) in a race against time after a mission gone wrong. Mission: Impossible - Fallout is again directed by prominent American screenwriter and filmmaker Christopher McQuarrie, director of the films The Way of the Gun, Jack Reacher, as well as Mission: Impossible - Rogue Nation previously. The screenplay is also written by Christopher McQuarrie, based on Bruce Geller's original M:I TV series. Paramount will release McQuarrie's Mission: Impossible - Fallout in theaters everywhere starting on July 27th, 2018 this summer. Are you planning to watch? How was that?